Following on from our memorable performance of Elijah in 2014, we are delighted to present Saint Paul, written when the composer was in his twenty-sixth year. 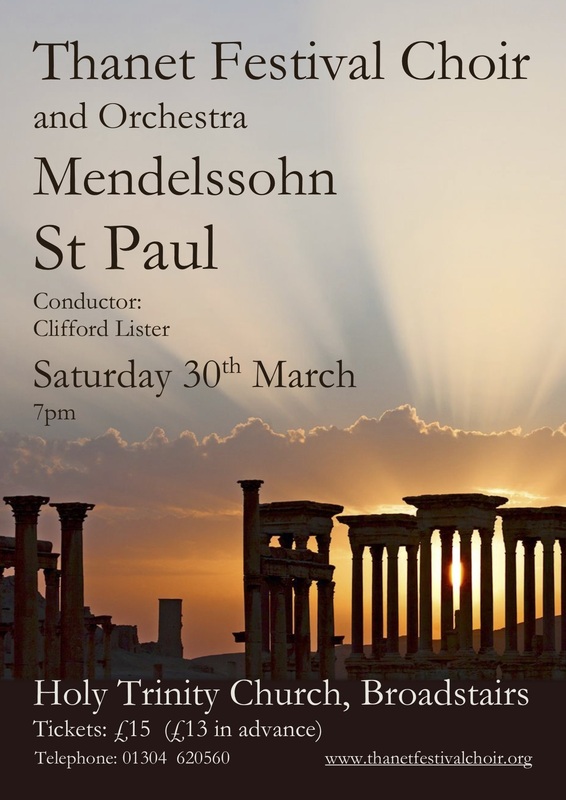 The oratorio tells the story of various events in the life of St Paul, with an integrated scheme of recitatives, arias and thrilling choruses telling the story of the Apostle. The text is based largely on The Acts of the Apostles, and there are three principal themes – the martyrdom of Saint Stephen, the conversion of Saint Paul, and the apostle’s subsequent career. 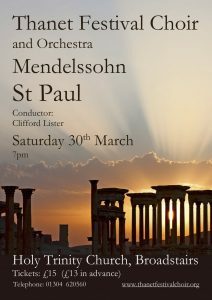 During Mendelssohn’s lifetime, Saint Paul was a popular and frequently performed work, but it is now rarely performed in its entirety. Indeed, as far as we know it has not previously been performed in the Isle of Thanet. This is a great pity as Saint Paul is a compelling piece, full of musical invention and innovation, with wonderful orchestration. Don’t miss this rare opportunity to hear it!